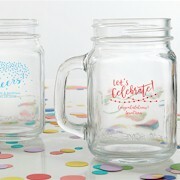 Present your special treats with one of our personalized glass jar favors. 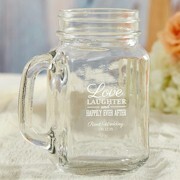 We carry them in different shapes and sized such as mason jars, hinged jars and even vintage glass milk bottle. 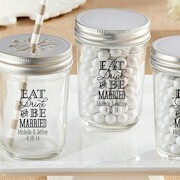 Small keepsakes such as these jar favors will add something personal to your reception table. 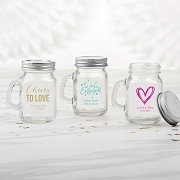 Our designs are available for: weddings, bridal showers, birthdays, baby showers and religious events. Personalized 16 oz. 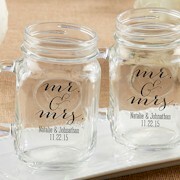 Mason Jar - Mr. & Mrs. 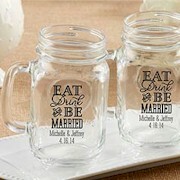 I used these mason jars for my sister''s bridal shower. 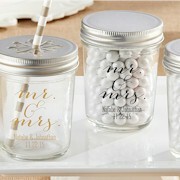 It was just the right size to put a little bit of colorful candy in and top off with one of the personalized stickers!